• For quantitative determination of α-mannosidase enzyme activity using a p-nitrophenol based substrate. • Fast and sensitive. Linear detection range (10 μL sample): 1 to 250 U/L for a 10 minute reaction. • Biological samples e.g. plasma, serum, tissue and culture media. • α-MANNOSIDASE (AMA) is an enzyme which catalyzes the cleavage of the α form of mannose. α-Mannosidase assists in the breakdown of complex sugars from glycoproteins in the lysosome. Defective AMA or deficient AMA activity causes α-mannosidosis and leads to deterioration of the central nervous system in children. BioAssay Systems? non-radioactive, colorimetric AMA assay is based on the cleavage of 4-nitrophenol from the synthetic substrate. Nitrophenol becomes intensely colored after addition of the stop reagent. 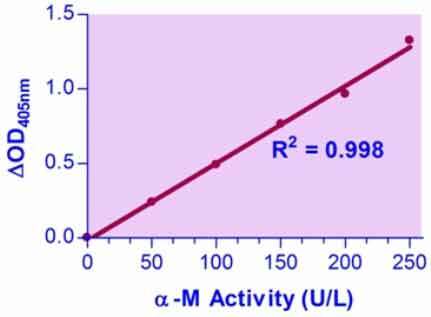 The increase in absorbance at 405 nm after addition of the stop reagent is directly proportional to the enzyme activity.